In the last post we left you at Apollo Bay. We continue our journey at the majestic Great Otway National Park. Actually, the National Park starts already at Anglesea and the Great Ocean Road (GOR) meanders along the Park. But at this point the road winds its way through the Park. There are a few activities to do around here, like walking or visiting the Cape Otway Lighthouse. Mind the koalas when driving towards the Cape! This is a detour of about 13 km from the main road, and you will have to drive the same way back. The camping-sites along the Cape are nice (but basic) with the ocean right at your doorstep. But our absolute prime campsite along the GOR is Johanna Beach. From the main road there are two options to drive down to the beach: a sealed road and an unsealed road not suited for caravans. The campsite is basic (only has a drop toilet) so be self-sufficient in all ways. The beach is magnificent … And from time to time the Rip Curl surfing contest is held here instead of at Bells Beach. The GOR mainly meanders along the ocean, but during about 40 km till Princetown you can enjoy the hinterland. Princetown is a small village, and a good base to visit the famous 12 Apostles. This rock formation is formed by the erosion during millions of years, remind that the rocks are limestone so the water and wind can cause a lot of damage but also create wonderful architecture of Mother Earth. We’re not sure where the name derives, but there are no 12 rocks at this place. Although there are massive tourists around here (the parking lot is gigantic) and the helicopters keep flying above your head, the rocks themselves are beautiful. Especially at sunset, when the colours change and the sun sinks in the sea … Be sure to stay a bit till after the sunset, to see some little creatures popping out of the water: this place is a breading place for little penguins (another good spot is the London Bridge). They are the only penguins breeding on the Australian mainland. And yes, they are very small! The Apostles are beautiful, but just before there is a must-see: the Gibsons Steps. Only when you are at the beach, you realize how high the cliffs are (70 meters) and how rough the water can be (swimming is prohibited). Less tourists come here (or don’t go down the beach), just lovely! Just a few kilometres behind the Apostles the next natural wonder awaits you … (and it doesn’t stop here) Loch Ard Gorge. You can walk on the beach here if you want, or watch the gorge from a viewing platform. Back to the coast then. 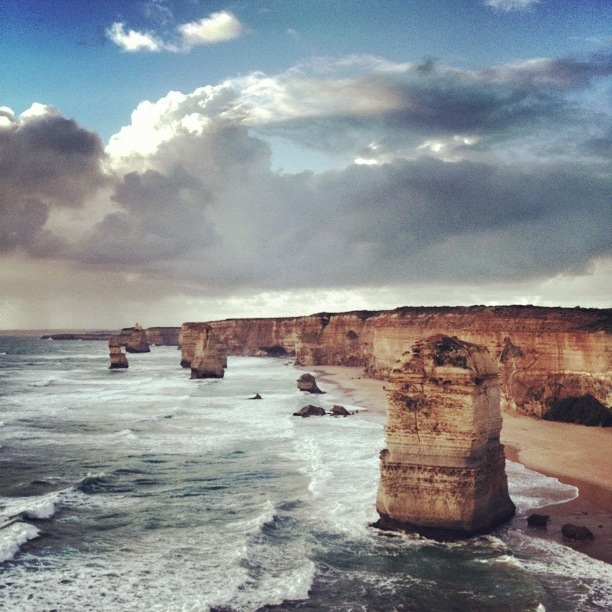 Along this stretch of the GOR, Port Campbell is the biggest village till Warrnambool. Don’t expect big supermarkets though but small bakeries and cafes will do fine. It’s only a few kilometres to the next stop: The Arch. When you sit, you’ll understand why it is called like that. And just after the Arch, stands a familiar bridge: the London Bridge. Made out of limestone and broken in the middle … In the past people could walk (not sure if this was legal, but they did it anyway) over the ‘bridge’ till the end of the cliff. In 1990 however, the bridge collapsed and two travellers had to be rescued who found themselves between the gap and the ocean on the remaining rock. Now this is why you always have to obey the signs telling you to stay on the designated path and away from cliff edges. The GOR ends (or begins if you drive it the other way) at Warrnambool. There are a few things to do in town, and best promoted must be the Flagstaff Hill Maritime Village, which is artificial and expensive. More interesting to have a look at is the Middle Island Maremma Project. Maremma dogs are deployed to protect ‘short tailed Shearwater’ birds (also known as Muttonbird) and Little Penguins. The number of animals were heavily under pressure because of fox and dog predation, but since this project started (2006) more and more birds and penguins can be found here. This is the end of the GOR, but since it is only about 12 km out of town, we wanted to write something about Tower Hill Reserve as well. It is a unique place, where nature has found a way to survive in an extinct volcano crater. Lots of wildlife can be spotted here, we even saw a turtle and a snake … Definitely worth a visit! Volg het bord Canberra van travelformotion op Pinterest.